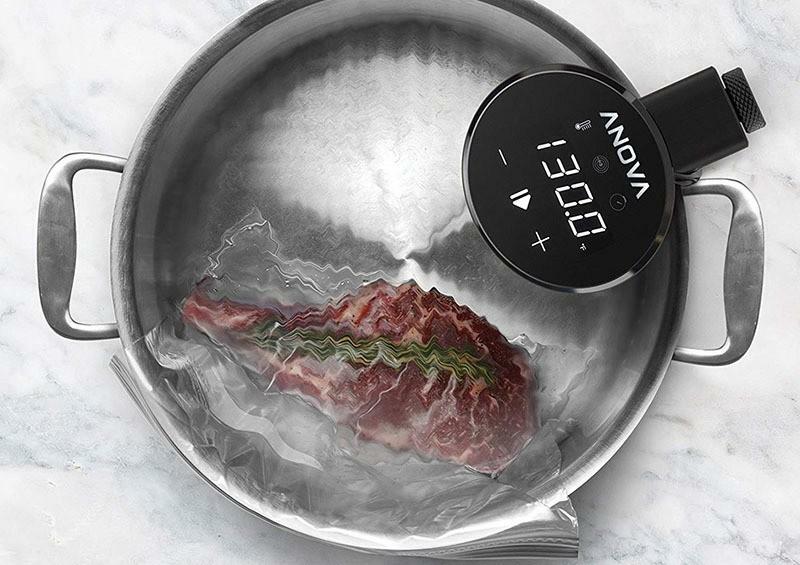 The Anova Sous Vide precision cooker is a pure form of culinary novelty. It is not for everyone, plain and simple. You have to consider yourself a pretty hard-core advanced chef to even consider all the hustle and bustle of sous vide cooking and all the pros and cons that come with it. So might be asking yourself already – what is sous vide (suvee, souve, as often people pronounce it) and do I really need it. Want it? You sure will! I do so much that I went and bought one during the Kickstarter campaign when Anova was a pure novelty and no one really knew if they will even develop a proper product. So hang tight as we go over the Anova review, the features, the pros, the cons and at the end, you get to decide whether you want one as much as I did. 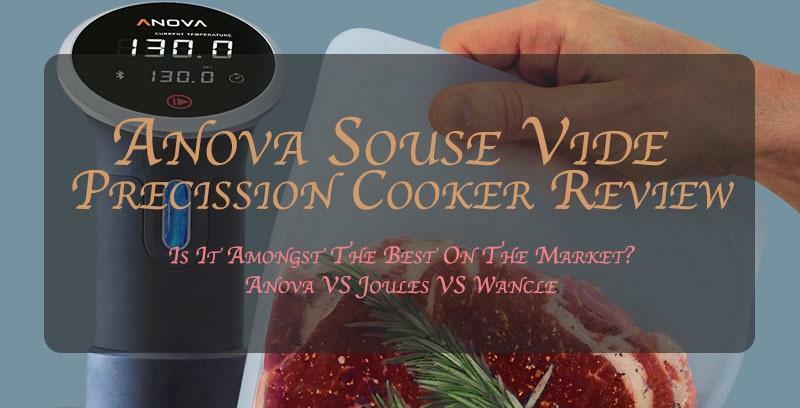 The Anova precision cooker is a delicate sous vide wand that heats and circulates water plainly put. Sous vide is a somewhat recent, high tech cooking technique that delivers incredibly tender and juicy meals. Sous-vide directly translates to “under vacuum” in French and it cooks food that is vacuumed in a plastic bag and submerged in water for a prolonged period of time at a low, but steady temperature. The temperature is usually set around 140F or 60°C and it supports breaking down of proteins in a much gentler way over a very long time, compared to most traditional cooking techniques. Also, the long cooking times ensure that the food is cooked evenly and thoroughly without losing any texture and without drying the food in any way – after all, it is vacuumed inside the water bath so there are nowhere for the delicious juices to escape. That’s exactly what the Anova precision cooker does. In its basic form, it is a water heater and circulator that when submerged in an appropriate container, can heat and maintain that water in it at a very precise temperature, ensuring food is cooked exactly the way you wanted it to. Currently, the Anova offers two separate suvee cookers – the Nano wand and the second generation Bluetooth and WiFi models. The Nano, as you can probably guess, is the smaller of the two and it is geared towards smaller households and meal portions. The Anova Nano is best fitted towards cooking one to four portions max. The heating element is 750 watts and it can heat properly water of up to 5 gallons. The second generation Anova has two sub-models. One of them is Bluetooth only, the other – Bluetooth + WiFi. Whether the Anova WiFi is of importance to you I can’t really tell. I couldn’t really justify the extra price since I’m pretty happy with the Bluetooth only version. I guess the WiFi is nice if you live in a larger house where the kitchen is a bit far out and Bluetooth can’t really reach that far. Unfortunately, mine isn’t so I didn’t really see the point of paying extra for the WiFi upgrade so I simply skipped it. If you think you need it – the difference in price is not that bad, I just couldn’t personally justify it over my budget. So, for the most part, this review will be based on my own experience with the second generation Anova precision cooker with the Bluetooth option. You can control and set the temperature via the app if you are connected over Bluetooth. The big suvee Anova has a heater rated at 800W and it is rated for up to eight people portions at a time. Depending on the model you choose, you can connect to your Anova circulator over Bluetooth or WiFi. As I mentioned above, I didn’t test the WiFi model because I just couldn’t justify the price and it is a feature that is personally not that important. My kitchen and my living room are almost one so whenever I work on my laptop or watch TV in the living room, I’m always within Bluetooth range. Both the Nano and the gen II immersion circulators support BT so I was always connected. When you connect the cooker to your phone or tablet via Wi-Fi or Bluetooth, you can manage the settings via the Anova app. 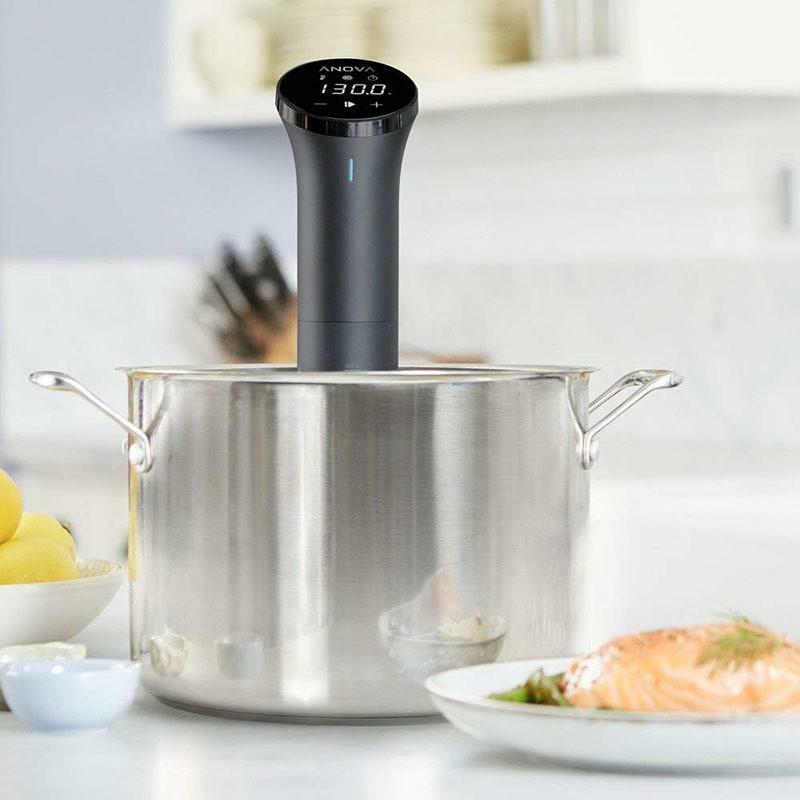 Upon opening the app, it quickly scans and connects to the sous vide machine to set the desired temperature and the type of meal that is cooking. 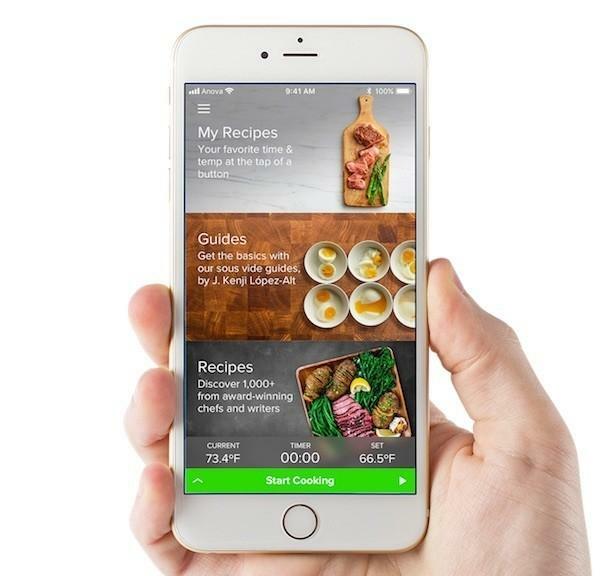 By using the app, you can control the time and temperature settings, and monitor the progress of cooking. This is an important feature because it allows you to check if the temperature remains consistent and to see how much time is left until the food is done. The Anova app is very useful as it has literally a ton of presets for meats and different steaks and whatnot. All you need to select what’s cooking (good looking) and it will automatically adjust the time and the temperature required for optimal results. The cooking performance is phenomenal for both Anova wands. The Nano, as you can expect, is a bit slower and less powerful than the big sous vide machine, but it does the job and it does it well. After all, it is only 50 watts “weaker” than the big one and while it does reflect on the cooking and mostly heating time, it is not by much, and what’s best, the price reflects that. By following the recipes in the app you can achieve gorgeous, deliciously tender and falling off the bone meats and fish. Veggies too, but most people prefer to cook the meat in the sous vide and veggies on a side in a traditional oven or on the skillet. The Nano is rated for up to 5 gallons of water, so make sure not to put more. It will heat it, eventually, as I tried for the review sake, but it literally takes forever and it is just not designed for that. Five gallons is the maximum amount of water it’ll heat and maintain heated for prolonged periods of time. The big Anova is a bit more powerful, but not by much. I could get it to maintain 160 degrees in a 7 gallons bucket, but it wasn’t as consistent as I’d like it to be. My personal opinion is that both Anovas work best at around 140F and submerged in water of up to five gallons. The result, as you can expect, is phenomenal. After three hours of cooking at 130 degrees in the sous vide and 1 minute sear on each size in my cast iron skillet, I tested one OF THE BEST RIBEYE STEAKS I HAVE EVER TASTED!!!! Yes, it needs the capital letters. It deserves them too. BIG TIME!!! More on that later. That really depends and, to be honest, is not that different between the Nano and the big Anova model. With only fifty watts of a power difference between the two is almost negligent. The water bath eating time really depends on the temperature that you start with. I found it best to start with lukewarm to warm water. It then takes the immersion circulator only a few minutes to heat the water to 130-140 degrees. It doesn’t really matter if you use the cold water or the hot water taps since the food is vacuumed inside and the taste of the water won’t affect the end result one bit. Starting with cold water can be an adventure. Of course, I had to try it, silly me. If you start with cold water, both the Anova Nano and the Wifi (for the lack of better model differentiation) will take forever to heat. And I mean forever. Just for the test, I started with almost ice cold water and both sous vide machines turned on at the same time. Both took over 30 minutes to heat cold water to 140 degrees. True, the WiFi version was a tad quicker, but honestly, by a very negligible time of three minutes. For best results, I found it best to start with lukewarm to warm tap water at around 80 to 100 degrees. It will only take a few minutes for the Anova immersion circulator to pick up the pace and bring the water quickly to 130-140 degrees. Otherwise, you’ll just be wasting too much time waiting for water to heat and might end annoyed and disappointed with the whole precision cooking idea. While the Anova app has a plethora of cooking recipes and different guides, I will try to keep you updated on what I can find that works best in a sous-vide environment. Please keep an eye on my blog for new and updates recipes that involve the Anova in the preparations and the cooking of the products I use. So far, steak has been amazing. I do it very simply and I follow the tried and true Gordon Ramsey’s recipe for cooking a steak. Basically, you sous-vide the steak (I prefer ribeye, but you do you) for three hours at 130 degrees. The app recommends between an hour and four hours depending on the level of cooking you desire, but I find it to be the better the taste the longer it stays. So three hours is on the verge of my patience and just enough to absorb all those flavors and spices I vacuum the steak with – rosemary, butter, and whole black peppers. After it is done, you need to pat the steak dry in case any water go inside the bag. Add salt and crushed black pepper to taste and place it on an already heated skillet grill to cook. Add some crushed garlic to the pan and some whole rosemary too. Cook the steak’s side a minute for rare to medium-rare, flip and add butter. After another minute take it out, let it cool down and serve with your favorite garnishes and sides. What Can You Cook with the Anova? You can cook almost anything with the Anova, but to be honest, meat and fish are the best. It can cook potatoes and other veggies as well, but you can cook those at a very acceptable level using traditional methods as well. Meat and fish, on the other hand, are a lot trickier and much easier to over or undercook on a grill or in the oven. 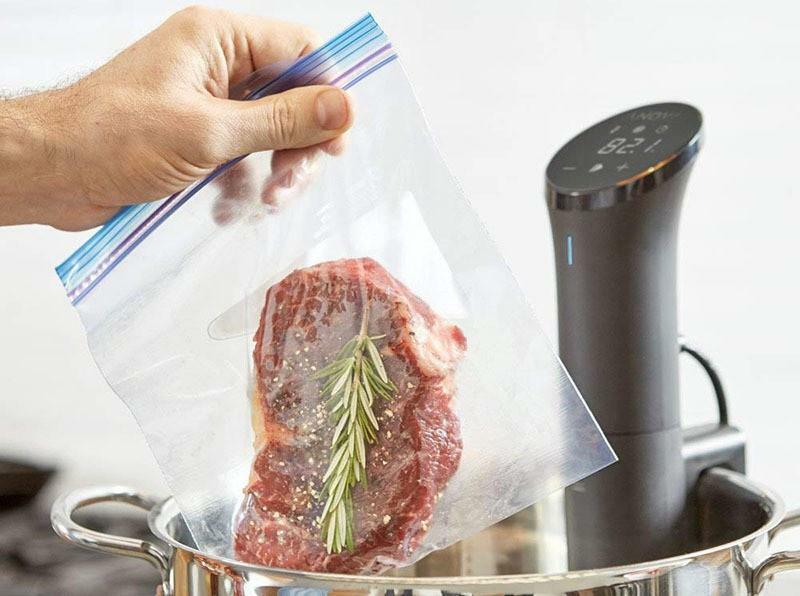 Sous-vide-ing meat ensures optimal cooking temperature and even cooking of the mean without ever reaching temperatures that can actually damage the end result. There is not much to compare the two, but you can see the full ChefSteps Joule cooker review and see for yourself. I think they are both worthy competitors for the best sous-vide cooker title for 2019. I have to admit, I really like both the Nano and the “big” Anova wand. While the Nano is smaller and supposedly less powerful, it feels more modern and up-to-date compared to the Anova WiFi. Well, not really the WiFi, but the second generation immersion circulator that has fifty watts more on the Nano, but it doesn’t feel in any way superior to the latter, to be honest, regardless of the higher price and the “higher” power. The Nano is the best of both worlds – affordable enough for most and it has almost all the bells and whistles of the big brother. If you don’t need WiFi connectivity, in particular, I can wholeheartedly recommend the Anova Nano over the WiFi version without the actual WiFi. The latter is supposedly bigger and stronger, but the time difference between the two when heating ice cold water to 130 degrees was beyond negligible over the time it took for both. It is also more expensive and a lot bigger than the Nano too, which is designed to fit in your kitchen drawer too. So the Anova Nano is the clear winner in my book and I can wholeheartedly recommend it to anyone looking to dip their toes in the lukewarm waters of sous-vide cooking on a budget.